From kitchen herbs to alpines and strawberries, there are many options for planting your BinDock - from low to high maintenance, ornamental or functional. Here we outline three groups that some customers have found useful: ‘Varied planting’; ‘For biodiversity’; ‘Low maintenance, drought-tolerant to rainfall-only planting’. Depending on whether your BinDock is often in shade - or in the heat of full summer sun - there are plants that thrive in each condition. To understand the growing conditions, it’s worth noting: the growing medium is shallow compared to a garden bed. 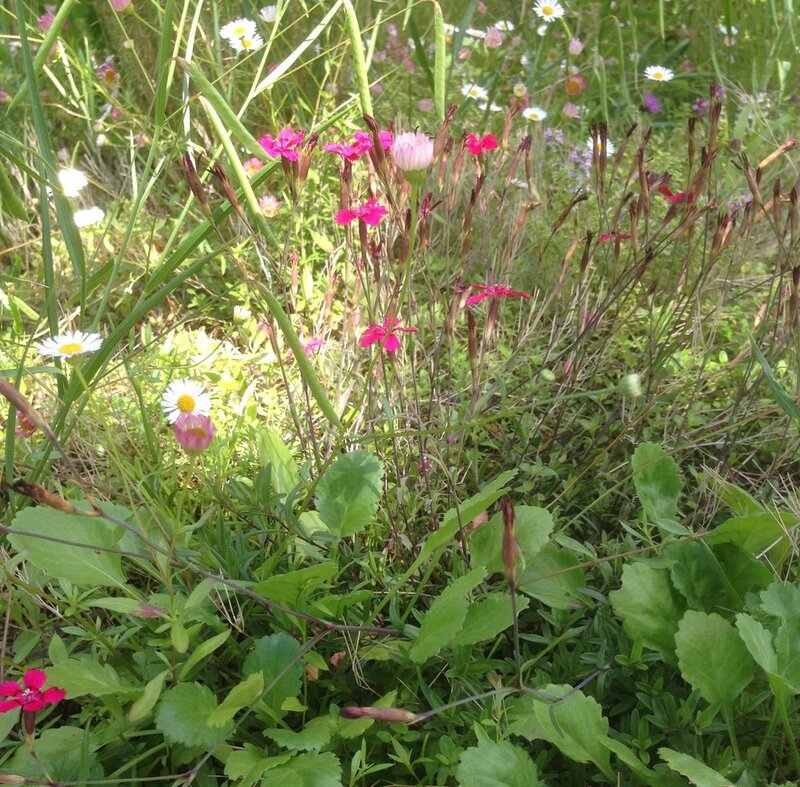 Plants that naturally grow in the thin soil of native chalk downland, or alpines that grow in thin rocky soils, are most suited to the shallow soil and harsh conditions of green roofs. As ever, our customers have always far exceeded the plants we ever thought to recommend! (managing fruit, vegetables, and many more demanding plants). Soil/compost can be formed into mounds and depressions to suit plants that need that bit more depth and moisture retention. Watering will depend on soil conditions and chosen planting. Nearly all plants in flower will provide nectar for insects. But to really encourage and enjoy seeing butterflies, hoverflies and bees, native flowers give a food source and habitat often uncommon in urban areas. A wildflower mix of seeds such as birds foot trefoil, fox and cubs, yellow horned poppy, small scabious, greater knapweed, & cornflowers will gives lots of flowers and nectar for pollinators. Plants such as these will benefit from watering through dry spells, and the annuals will die back in autumn. Autumn is the time for planting bulbs such as crocus, grape hyacinth & snowdrops, to come through early in the new year - and be the first sources of nectar for pollinators. Hebe Pascal with reddish leaves in winter, Hebe Carl Teschner with more sprawling growth, can tolerate periods of drought. "Rainfall-only planting" - requiring the lowest levels of attention - usually will take the form of bulbs (e.g..crocus, grape hyacinth & snowdrops) and sedums. Sedums are hardy evergreen plants, with succulent, water-storing leaves. Often used for green roofs, sedums prefer poor, free draining soil. Plants are available as small seedling plugs or grown seedling mats. The following varieties are suitable: sedum acre, album, album 'Athoum & 'coral carpet', spurium 'tricolour', 'fuldaglut', & 'green mantle', sarmentosum, sexangulare and ewersii. Sedums are happy in a low nutrient soil/substrate, so a mix of compost, sharp sand and crushed aggregate or gravel drains well and may be ideal for this planting mix..
Until established, all plants need watering during dry spells.